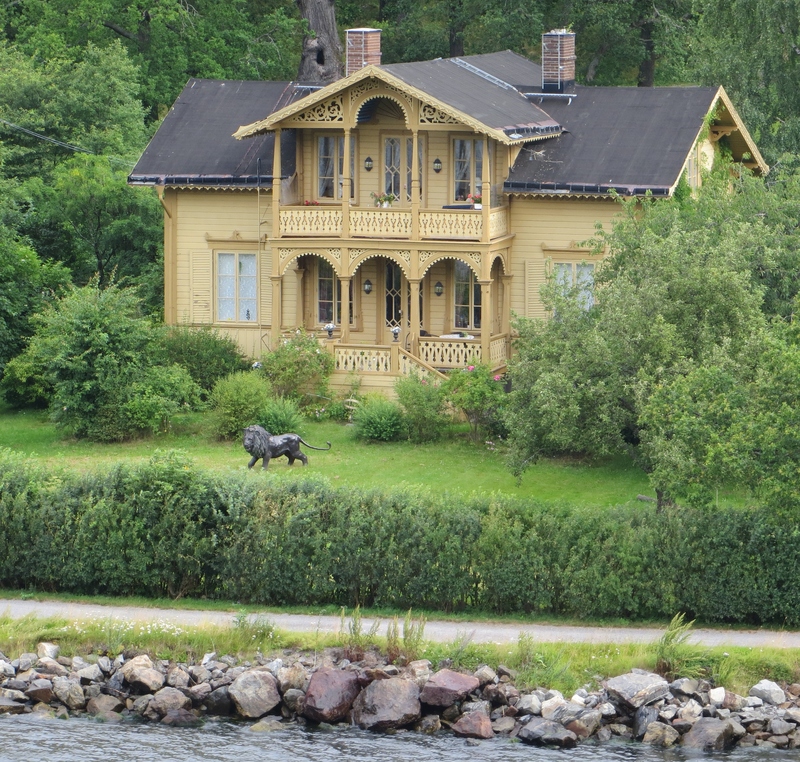 This report on my Baltic genealogy cruise with Unlock the Past in July 2015 is a bit late but I hope that people will still be interested in what I learnt from a great geneaconference at sea. For those who don’t know I had a fall while on a shore excursion in Germany (sadly just the second port of call and the 4th day of a 14 day cruise) and broke my right elbow. After being patched up at the local hospital I went back to the ship and stayed until Copenhagen when I finally flew home for surgery. I missed the last two days at sea. But let’s start at the beginning. I flew to London a couple of days early as I wanted to do some sightseeing to places I had not yet seen. Two full day tours saw me visiting Leeds Castle, Stonehenge, the cliffs of Dover, the Battle of Britain memorial, Windsor Castle, Oxford, Canterbury Cathedral plus some London sights. Then I caught the bus down to Southampton to join the UTP genealogy cruise on the Celebrity Eclipse. Checking in was easy and I linked up with previous cruising buddies waiting in line too. It always amazes me that even though it is a big ship with lots of people, I always manage to find someone I know on the same cruise. This time I was sharing a cabin with a friend from the Gold Coast, and although I complicated things somewhat with my broken elbow, we both had a great time. After my accident I didn’t leave the ship and my friend kindly bought me a fridge magnet from each of the places I missed visiting, although I could see ashore from the top deck, it just wasn’t the same thing. I had wanted to go on this cruise for two reasons, first I had not been to the Baltic countries and second, there were some great presenters on the program. Old favourites Chris Paton and Paul Milner, and someone I had been wanting to hear for simply ages, Cyndi Ingle (from Cyndi’s List fame) plus Janet Few (The History Interpreter) and Jane Taubman plus a number of my favourite Australian speakers. The program started on Day 1 with Paul Milner giving an after dinner talk on what were our ancestors really like. A great start and the next day was in Bruges in Belgium. I simply had to buy some Belgian chocolate, taste Belgian beers and managed to find a beautiful knitted head scarf at the local market plus my fridge magnet holiday reminder. There are no talks when we are in port but as we left at 3pm, Chris Paton gave a talk on genealogy without borders and Cyndi Ingle told us all about how she used Evernote for genealogy before dinner. Carol Baxter (The History Detective) was the after dinner speaker with how to be a skilled historical detective. Day 3 was at sea with a full program of talks in two streams, which always makes it hard to choose. Cyndi was first up with foreign language tools for English speaking genealogists and then my talk on what was the voyage really like was next. Sadly this meant I had to miss Caroline Gurney‘s talk on merchant seamen which I would have liked to go to as I have a merchant seaman. Carol Baxter followed my talk with how to craft a good book. After a short break Eric Kopittke spoke about German civil and church records then Jane Taubman gave the first of a series of talks on how to use Family Historian which has its own user group. I had downloaded the free trial early in the year but then my partner broke his leg and my free time evaporated so I never managed to really try the software out. It was good to go to Jane’s sessions and see how it could be used and my intention was do change over when I got home. Without the use of my right arm for three months that hasn’t happened yet and with Christmas fast closing in, it will probably be a new year challenge! 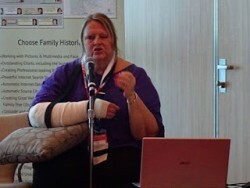 After lunch I was really pleased to be able to hear Janet Few speak. I had been following her The History Interpreter blog and her talks are fantastic as she packs so much into each session. A must listen to speaker if you get the chance. This talk was an A to Z of some less known UK sources and there were a few I didn’t know about. There were four talks before dinner including mine on how diaries and letters can flesh out family stories. The after dinner speaker was Cyndi giving us a tour of Cyndi’s List. Day 4 was in Warnemunde, Germany and my unfortunate fall and subsequent visit to the Wiemar Hospital. Day 5 was at sea and again two streams of talks, only this time without my right arm I could not take notes, simply sit and listen. I was scheduled to give my talk caring for family archives in the morning and the Unlock the Past organisers had arranged for Chris Paton to give an extra talk but I wanted to go ahead with my talk. Helen Smith took a photo of me doing the presentation and it was only after seeing the photo that I realised how bad my fall had been. Now I wonder how I ever gave the talk and can only think that I was still in shock and running on adrenaline! In the evening Chris Braund and Janet Few presented an evening with Master Christopher a 17th century barber which was one of the funniest shows I have ever seen. They had everyone laughing and several people volunteered to be treated by Master Christopher. I have a barber/surgeon in the family so it was also of family history interest as well. Day 6 was in Tallinn, Estonia and I wandered around the ship until everyone was back on board. 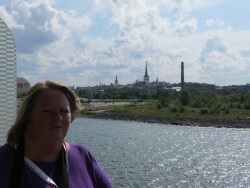 My cabin mate kindly took a photo of me with Tallinn in the background. It really is quite easy to amuse yourself without going ashore if you don’t want too, lots of activities on board not to mention all those wonderful food, drinks and coffee areas. Cyndi was again the after dinner speaker with a great talk on using Google Maps and Google Earth. Days 7 and 8 were in St Petersburg Russia with Helen Smith and Chris Paton the after dinner speakers with researching Australian and New Zealand Great War soldiers and British and Irish newspapers respectively. Even after big days ashore people still attended these talks. No one wants to miss out on learning new things. Day 9 was Helsinki, Finland and Helen gave the after dinner talk on researching health history. So many port days in a row was a bit tiring for those booked on shore excursions and in some ways I was glad that I wasn’t so busy every day. Day 10 was Stockholm, Sweden and the after dinner speaker was Jane Taubman on scanning and restoring old photographs. Day 11 was a full day at sea with two streams of talks. I did my family history on the cheap talk and listened to more of Jane Taubman on Family Historian, Barb Toohey on charting family history, Cyndi Ingle on using timelines for genealogy and Janet Few on one place studies. Helen Smith was after dinner with asking Grandma before it is too late. 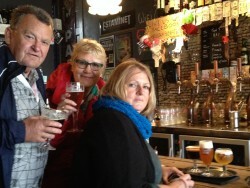 Day 12 was Copenhagen, Denmark and this was the day I left the ship to fly home. From my taxi I saw a little bit of Copenhagen before getting to the airport. I flew home via Dubai and Singapore and my travel insurer had arranged wheelchairs and lounge access at the two stopovers which made things a bit easier for me. I was really glad to get home but then it was a series of doctors, xrays/scans, surgery and recovery for the next couple of months. In fact I am still doing arm exercises to get my elbow and right arm in good shape again. Days 13 and 14 were both full days at sea and I was sorry to miss those talks. Some speakers put their talks/handouts online for attendees and I was able to download those and see what I missed. Still not quite the same without the actual dialogue and/or slides. Some presentations from earlier cruises are still available on the Unlock the Past Resources page of their website and my presentations are on the Resources page of my website, scroll down to Presentations. Day 15 was docking in Southampton and had I not fallen, I would have got the bus back to Heathrow and flown home having seen some fantastic countries and listened to some great genealogy speakers. I am indebted to my cabin mate not only for those fridge magnets but also to the wonderful photos she shared with me. Quite a few people also put their photos on Facebook so I could see those too. Tony Beardshaw from My History was the official cruise bookseller and he had a range of tempting products and Gould Genealogy and History offered a 20% discount on their Unlock the Past ebooks and some speakers sold their own books direct. Temptation was not only in the dining rooms! Although this was not one of my better cruising experiences, I still think cruising and genealogy conferences are wonderful. So much so that I am going on the 10th Unlock the Past cruise to New Zealand (Auckland, Bay of Islands, Tauranga, Wellington, Akaroa, Dunedin, Milford Sound and then on to Australia calling at Sydney, Melbourne, Adelaide and finishing in Perth. The key presenter is another person I am looking forward to hearing in person, Judy G Russell, The Legal Genealogist and it is another chance to catch up with Louis Kessler. Check out the other presenters here. It is about 3 months away and I’m excited already. Anybody joining me? ?